For Hawaiian Airlines, after a solid financial performance in 4Q2014 and CY2014, a combination of currency headwinds and industry capacity increases on North American routes are creating unit revenue headwinds during 1Q2015. 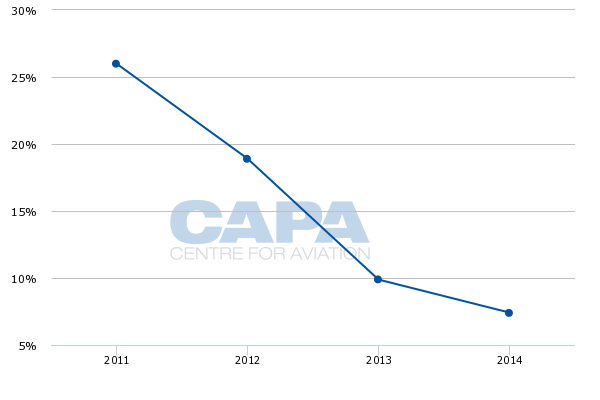 The airline’s guidance projects the deepest decrease reported by any US airline. The capacity pressure is driven by additions from both Hawaiian and its competitors on routes to the US mainland. During 2014 Hawaiian opted to redeploy some capacity from long-haul routes that were eliminated back to the US west coast, and still believes that the decision is producing favourable results despite the current capacity pressure. As it navigates through some revenue challenges in 1Q2015, Hawaiian’s capacity growth is slowing from previous years, and it is also forecasting a decent cost outlook for CY2015, welcome signs that some of the headwinds it has faced in the past are starting to subside. Hawaiian’s 4Q2014 profits fell from USD17.1 million to USD11.1 million year-on-year, but increased from USD51.8 million to USD68.9 million for CY2014. Operating revenues increased 8% in 4Q2014 to USD574.8 million and 7.4% in CY2014 to USD2.3 billion. Hawaiian’s increase in CY2014 operating revenues was slower than previous years. During CY2011 operating revenues increased 26%, grew 18.9% in CY2012 and rose 9.9% in CY2013. Hawaiian recorded a 3.1% rise in passenger unit revenues during 4Q2014 in its scheduled operations and 3.5% growth for CY2014. Its yields in scheduled operations increased 1.3% in 4Q2014 and 3.4% for CY2014. Added capacity on Hawaiian’s North American routes contributed to a 3.3% decline in passenger unit revenues on routes in that region. Previously Hawaiian has estimated that industry capacity from Hawaii to North America would grow 11% year-on-year in 4Q2014. During the quarter North America represented just under half of its overall passenger revenues. Hawaiian’s passenger unit revenues on its inter-island routes increased 2.1% on a 8% rise in capacity and 1.7ppt drop in load factor. 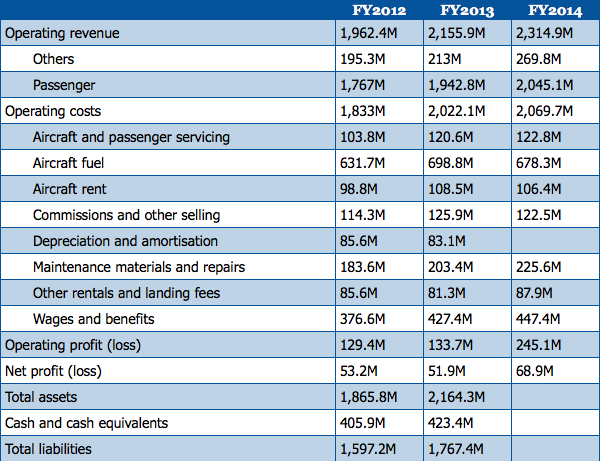 Those routes represented roughly 24% of the airline’s total passenger revenues in 4Q2014. 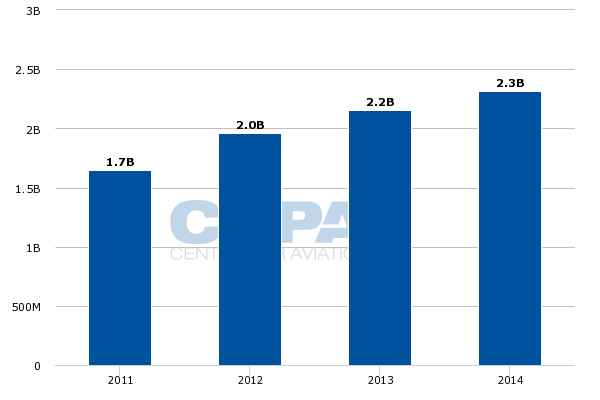 The airline’s performance in its long-haul Pacific routes continued to improve, with passenger unit revenues jumping 11.4% year-on-year in 4Q2014 after plummeting 10.6% year-on-year in 4Q2013. During 2014 Hawaiian engaged in an overhaul of its network to bolster its performance, and cut service from Honolulu to Taipei in Apr-2014 and to Fukuoka in Jun-2014. The elimination of those underperforming markets and the slowing of Hawaiian’s rapid long-haul growth over the last four years are helping to improve its performance on routes to Asia and Australia. Hawaiian opted to re-deploy some of the capacity it cut from Asia to the US mainland. During 2014 the airline launched seasonal flights from Lihue and Kona to Los Angeles and Oakland, transitioned Maui-Los Angeles service to year-round and re-introduced flights from Honolulu to San Jose. In late 2014 it began flights from Maui to San Francisco. During 2013, both Alaska Airlines and Hawaiian opted to adjust their capacity from Hawaii to the US mainland to restore supply-demand equilibrium, but the balance appears to have vanished. “Based on published schedules industry capacity between North America and Hawaii will be at record levels in the first half of the year , with the year-over-year growth leveling off a bit in the third quarter,” Hawaiian chief commercial officer Peter Ingram recently explained to analysts and investors. Mr Ingram acknowledged “our network adjustments in 2014 contributed to this growth and remain extremely pleased with the results of those changes”. He noted that as 2014 drew to a close, Hawaiian’s booked load factor for 1H2015 “came under some pressure”, and those trends continued into the early part of 2015. Mr Ingram stated Hawaiian has seen some recovery more recently, but cautioned, “we have some ground to make up on strong prior year results”. In contrast, in 1Q2014 Hawaiian’s yields in scheduled operations grew 5.7% and passenger unit revenues increased 4.4%. To mitigate some of the pressure on North American routes Hawaiian is adjusting some of its service for 2Q2015 through pushing back the start date of some seasonal flights and stresses that, despite the tough environment, “the financial performance of our North American routes remains very good”, said Mr Ingram. The pressure in North America, along with lowered fuel surcharges on some of Hawaiian’s international routes and the strengthening USD against the AUD and JPY are combining to drive down Hawaiian’s projected unit revenues by 3.5% to 6.5% in 1Q2015. The company estimates the strengthening USD and the lower fuel surcharges are contributing about 3ppt of the drop. Hawaiian’s 4.5% unit cost rise excluding fuel in 4Q2014 was better than previous estimates of 5.5% to 8.5% growth, driven by a decrease in frequent flyer expense and lower than expected future fuel prices. 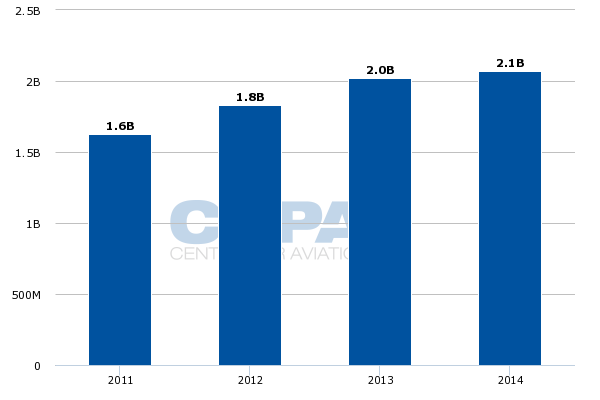 The airline recorded a USD12 million decline in fuel expense year-on-year in 4Q2014, but its non-operating expense increased USD53 million largely driven by fuel hedging losses. Its mark-to-market changes, and gains and losses on premiums paid, run through the company’s non-operating expense calculations, and totalled USD35 million in 4Q2014. Hawaiian faces some cost headwinds in 1Q2015 before its unit costs fall for CY2015. During the first quarter it anticipates growth in its unit costs excluding fuel of 1.5% to 4.5%, and is sticking to previous estimates for CY2015 growth in the low single digits after recording a 3.4% rise in CY2014. 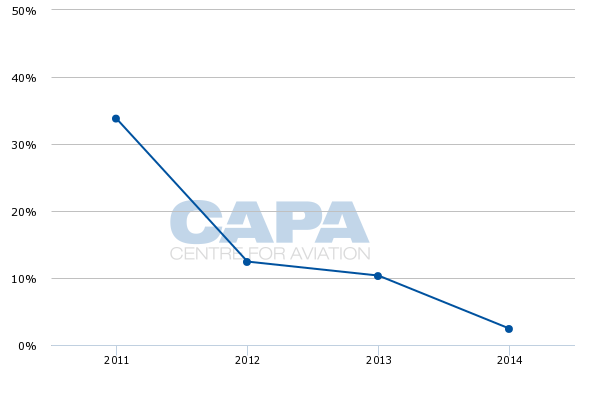 Some of Hawaiian’s cost headwinds in 2015 include higher pension expense and increases in aircraft rent resulting in lease return costs for two Boeing 767s exiting the fleet at the end of their lease term. Previously, Hawaiian has stated it has no plans to add a new route in 2015, and its projected capacity growth of 3% to 6% for the year is up from the 1.7% it posted in CY2014, but far below the 14% recorded in CY2013 and the 22% growth recorded in CY2012. Its current projections are also slightly lower than the 4% to 7% rise it projected near the end of CY2014. Some of the challenges Hawaiian is facing in early 2015 are familiar – overcapacity on routes to North America. Although it does not seem as if the airline is ready to scale back its operations to the region, it can perhaps offset some of the unit revenue sting from newish ancillary products it has debuted during the last year, including an extra legroom add-on. It is not clear if Hawaiian has a lot of options to alter its capacity deployment to North America, but given that the region remains its largest generator of passenger revenue, the airline and its competitors may need to take steps once again to restore the supply-demand balance.